Amla is a wonder berry. Rich in vitamin C, it is a common household winter fruit in India. It is used to make pickles, jams, juice and mouth fresheners. 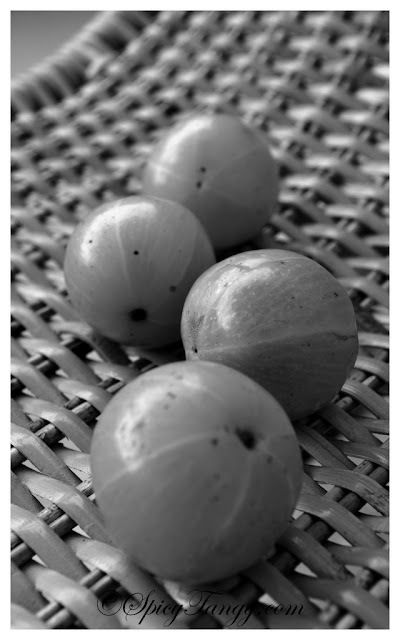 Since this is Amla season here in Bangalore, I thought of sharing a picture with you today. Please share new recipe. I get excited whenever I see Spicy tangy mail. But these days I din't find any new recipe. Diwali is coming dear and I need your help as always. Please share some new recipes for the festive season. Check out today's recipe :) !! Noodles just for YOU :)! and yes do try corn and capsicum soup which i posed couple of days back !! Thanks Dear for all your support ! A truly beautiful still life, Shuchi. I've always been partial to fresh gooseberries and currants, very unique in the world of fruit. Thank you for your great BWW photo.